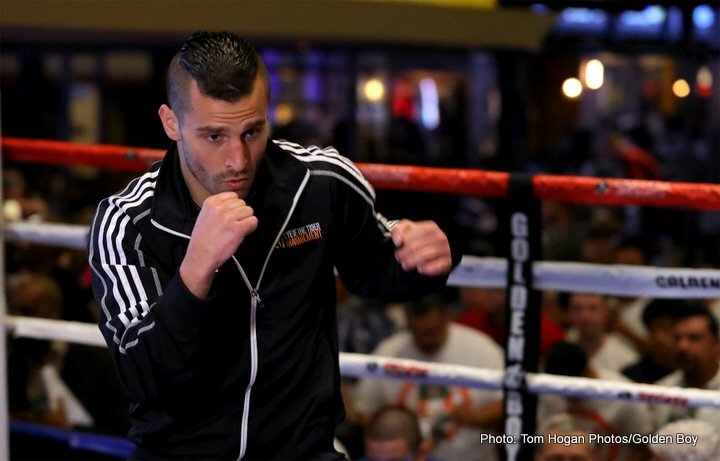 By Dan Ambrose: David Lemieux won’t be fighting on the undercard of Miguel Cotto (41-5, 33 KOs) vs. Sadam Ali (25-1, 14 KOs) on December 2 on HBO. Instead, the former IBF middleweight champion Lemieux (38-3, 33 KOs) will be headlining his own card on HBO Boxing on December 16, possibly against Hugo Centeno Jr. (26-1, 14 KOs) or James Kirkland (32-2, 28 KOs). Lemieux’s December 16 fight will be in Canada at the 16 at La Place Bell in Laval. This is unquestionably a better deal for Lemieux to headline his own card and not get stuck on fighting on the undercard of Cotto’s mismatch against welterweight Sadam Ali on December 2. The 33-year-old Kirkland would seem like an unlikely foe for Lemieux, since he hasn’t fought in 2 ½ years since his 3rd round knockout loss to Saul Canelo Alvarez on May 6, 2015. Kirkland was scheduled recently to face Miguel Cotto on February 25 on HBO pay-per-view at the Ford Cener in Frisco, Texas. The Cotto-Kirkland fight was later cancelled after Kirkland suffered a fractured nose during training for the fight. Cotto hadn’t fought in 1 ½ years at the time. The boxing public was not excited at the thought of seeing Cotto fight Kirkland on HBO PPV, as it was a fight between two inactive fighters that had seen better days in their careers. Kirkland hadn’t fought since 2015 as well. If Lemieux’s management does sign Kirkland for the fight, they might want to have a good Plan-B option in case he suffers an injury during training camp and can’t take the fight at the last minute. Lemieux vs. Centeno Jr. would be a better fight, but still not a great one. The 26-year-old Centeno Jr. is rated No.7 by the World Boxing Council at 160, and he’s won his last 2 fights in beating Ronald Montes and Immanuwel Aleem. Before that, Centeno Jr. was stopped in the 10th round by Maciej Sulecki last year on June 18. Centeno was totally over-matched against Sulecki, who walked him down and battered him until getting a knockout in the 10th round. Centeno Jr. looked a lot better in his last fight in stopping Aleem in the 3rd round on August 25. The tall stork-like Centeno Jr. was able to take Aleem out with his wide left hook. He’d been hitting Aleem with that punch from the opening bell, and it was only a matter of time before he knocked him out with it. Aleem showed that he had no clue in how to block or even track that wide left hook. Lemieux, 28, had talked about fighting Cotto in the main event of the December 2 fight card, but nothing ever came of it. The weight for the fight would have been a problem, as Cotto is currently the WBO junior middleweight champion, and he’s retiring after his December 2 fight. Lemieux, a very powerful puncher, would have potentially sent Cotto into retirement on the back of a knockout loss. It appears that Cotto is more interested in retiring with a victory; hence he’s selected the light punching Sadam Ali for his December 2 fight instead of a good fighter from the 154 or 160 lb. division. Golden Boy Promotions wanted Lemieux to fight on the undercard of the Cotto vs. Ali card, but his manager Camille Estephan wasn’t interested in that position, according to the Journal de Montreal. Estephan wanted a better option for Lemieux than fighting on the undercard of Cotto-Ali, which might not be seen by a lot of boxing fans due to the fight being viewed as a mismatch. To be sure, going from being a potential main event opponent for Cotto to fighting on the undercard of a likely mismatch between Cotto and Ali, it would be a hard pill to swallow for Lemieux. The ratings for Cotto-Ali might be quite low, as it’s not a fight that is highly valued by the boxing public. If Golden Boy is going to market the Cotto vs. Ali fight to the hilt, it’s unclear what angle they would use. ‘Come see Cotto fight a welterweight that was recently knocked out by Jessie Vargas.’ It’s not a great fight. HBO appears to be on board with the Cotto vs. Ali fight for some reason. It’s surprising they’re bothering to show the fight. In the past, HBO has focused on quality fights, but they slipped up in televising Cotto’s last fight against Yoshihiro Kamegai on August 26. That was a dull fight due to the fact that Kamegai was so over-matched. Cotto vs. Ali might be an even worse fight. Lemieuix being connected to that fight card would look bad in my opinion. It’s a good thing that Lemieux’s manager is pulling him off the Cotto-Ali card and having him headline his own card. Lemieux is ranked No.1 with the WBO at 160. He’d like to challenge WBO middleweight champion Billy Joe Saunders. However, according to the Journal de Montreal, Saunders wanted too much for him to travel to Canada o fight Lemieux in Quebec. If a future fight between Saunders and Lemieux is going to take place it’ll likely need to wait until the World Boxing Organization makes him the mandatory challenger and orders the fight negotiations to take place. Saunders, 28, wants to fight the winner of the Saul Canelo Alvarez vs. Gennady “GGG” Golovkin rematch. Canelo doesn’t appear to be too bothered about wanting to fight Saunders, as he’s not into collecting middleweight titles like GGG. Canelo is more interested in taking important fights. Saunders’ WBO title holds little interest for him. Saunders is not going to risk losing his WBO belt against a dangerous puncher like Lemieux. Lemieux was stopped in the 8th round by Golovkin on HBO PPV. Lemieux took a dangerous gamble in fighting Golovkin, and it failed to pay off. You can’t blame Lemieux for wanting to take the risk, as he seen by a lot of boxing fans for the first time in that fight. Since then, Lemieux has won his last 4 fights in beating Glen Tapia [TKO 4], Cristian Fabio Rios [UD 10], Curtis Stevens [KO 3] and Marcos Reyes [UD 10]. Lemieux looked good in those fights, showing power, boxing skills and stamina. Golden Boy Promotions are interested in eventually matching Lemieux against Canelo. Whether that fight ever happens or not is uncertain. Canelo did not look good in getting a gift 12 round draw in his last fight against Golovkin on September 16 in Las Vegas, Nevada. The fight showed 2 things that will limit Canelo for the remainder of his career at middleweight. 1. Canelo’s stamina is terrible. He’s only capable of fighting first minute of each round. 2. Canelo lacks the arm length to beat the taller middleweights. Lemieux would take advantage of Canelo’s size and stamina limitations. I have a feeling that Golden Boy realize that they’re going to need to be very careful with Canelo not to put him in with Lemieux or any of the other dangerous middleweights after the rematch with GGG. Lemieux will likely not get the fight with Canelo unless he starts looking vulnerable like Golovkin did.